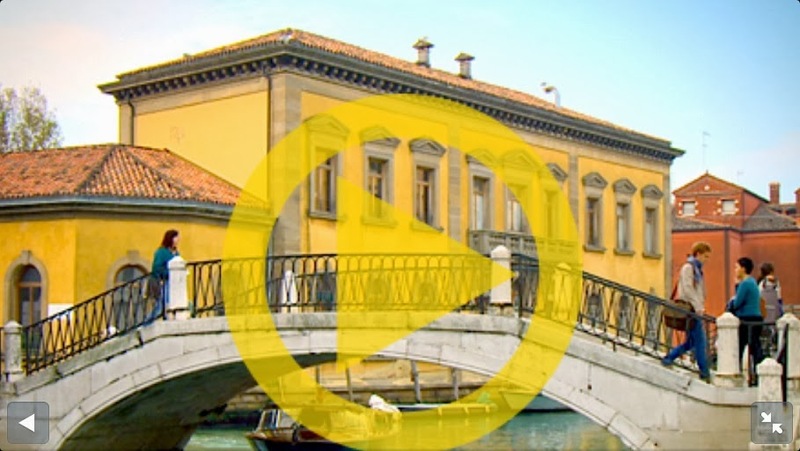 A friend of mine recently alerted me to a new series on Australian TV's SBS network, Strip the City which featured a 50-minute episode dedicated to old and new engineering problems and solutions in Venice. My interest was piqued immediately because the promotional image that I saw was that distinctive yellow building on Fondamente dei Cereri where the wonderful poet, Diego Valeri once lived. I was able to watch the Venice Sinking City episode online on SBS TV 'on demand' website but you'll have to be quick because the link is available only until 10 February 2014 (Australian time - and Australian time is ahead by at least 8 hours for most North American and European readers). I'm certainly not an expert on the science of preserving Venice from its many environmental challenges and nor am I generally inclined to watching engineering shows, however I found this this documentary to be comprehensible and interesting to watch. The episode covered ingenious engineering solutions from the past and present which have been applied to Venice's unique circumstances. A demonstration how Venice is sinking through geological forces by up to an inch every decade. Using a painting by 18th century view painter, Bernardo Bellotto, a geologist demonstrated how some parts of Venice are 2.5 feet lower in the water than in Bellotto's day, and asserted that Venice sinks by an inch every decade. An interview with a contemporary engineer explaining how the foundations of the campanile in the Piazza San Marco have been braced with titanium and granite to guard against instability, and how the movement of the campanile is monitored by over 100 sensors. How Venice is built is on over 10 million trees felled from the mainland - this vast forest is submerged in the mud, protected from oxygen where it remains stable. However, erosion and changing environmental circumstances are threatening this stable foundation. A graphical illustration of how wells in Venice are atypical - because Venice is built on salt water, Venetians devised an ingenious method of installing a large chamber to store rainwater, which was filtered through sand. A clay lining protects the chamber from the salty ground water. Over 6,000 wells in the city once provided vital water supplies to Venice. How Venetians used brick and plaster to build their buildings, but protected these porous building materials from the salt water of the lagoon by installing a limestone base. However, as Venice sinks, the water of the lagoon is rising above this limestone barrier and attacking the brickwork and plaster causing expansion and cracking. This allows salt water to further penetrate structures in Venice and if untreated can lead to the collapse of buildings. How extensive repairs were undertaken at the Salute recently to mitigate against water rising through the floor and breaking apart its marble flooring. Engineers removed 4,500 pieces of marble by hand, and installed protective layers above the soil/ brick foundation of the church starting with a plastic membrance, covered by a metal grill holding 2 miles of tubes conducting warm water to dry the moisture from the floor of the church. A concrete layer was then poured over the warm water and all 4,500 pieces of marble were painstakingly re-laid in their original places. How Venice experiences floods up to 250 times per year and how an immense weather tracking station was built 10 miles off shore in 1970, following the devastation of the 1966 flood. The documentary provided an explanation of how the siren system operates in Venice to warn residents and business owners of impending floods, and how four different tones are used to announce the expected severity of the flooding. An interview with chief fire officer, Alessandra Bascia (who also features extensively in a recent BBC documentary about Venice - Venice 24/7). Bascia explains how fire fighters were severely hampered by the lack of access to reliable water supplies and water pressure to fight the disastrous fire of 29 January 1996 (when the historic and beloved La Fenice opera theatre was burnt down). In the aftermath of the disaster, 700 fire hydrants were installed in Venice, fed by 30 miles of water pipes, providing a dedicated water supply for fire fighters. Bascia also demonstrates how during a flood or high water, it can be very difficult for emergency boats to navigate the lower bridges in Venice. The documentary shows footage of how fire crews can lower their windshields and duck down to improve their ability to fit under low bridges. The documentary ends with footage of the third of MOSE's 75 gates being lowered into the lagoon. The MOSE project, scheduled for completion in 2016, aims to protect Venice by forming a mile-long flood barrier across the three inlets to the lagoon. I do hope I can access this documentary, while I'm here in Venice. I'll hold my breath, cross my fingers and click on the link. Oh dear. I tried a 'Google' search but I couldn't find another link for you. If I do come across another site, I'll let you know. Buona giornata!